Traditionally, clothing labels have been sew-in name tapes or iron-on name tags, which can be time consuming and tricky to apply. We designed our stick on labels to provide a quick and simple alternative that can label clothing in minutes, not hours. Stikins stick onto the wash-care label of clothing, where they remain in place for wash after wash after wash. They can even be put through tumble-dryers. With our stick on labels for clothing you can rest assured that your items will remain safely labelled all year round! The thought of spending hours sewing in name tapes or ironing on name tags is enough to put anyone off – especially when you’ve got a mountain of clothes to label. Our unique adhesive is powerful enough hold your clothes labels firmly in place and lets you label dozens of items in minutes. Simply stick your clothing labels firmly onto the wash-care label of each item. Stikins can be used to label any item of clothing with a wash-care label, along with fabric items like bedding, towels, and soft toys – unfortunately, they cannot be used on socks. These personalised clothing labels are printed with a ribbon that is resistant to ingredients in sun creams and lotions that cause other ribbons to disintegrate – so your labels will remain perfectly legible all year round. Order Your Personalised Clothing Labels Today! You can choose from four pack sizes when ordering your clothing labels; 30 name labels for £6.80, 60 name labels for £9.50, 90 name labels for £12.00, or 120 name labels for £14.20. You can also order your labels online, by phone, or by post; we print and post orders every day, Monday to Friday, up to 3pm. To find out more about our clothing labels and all of the ways they can be used, check out our About Stikins and FAQs pages or get in touch with your questions and queries. Label your whole wardrobe; shirts, jumpers, coats, dresses, skirts, trousers, gloves, scarves, school & work uniform - even fancy-dress! 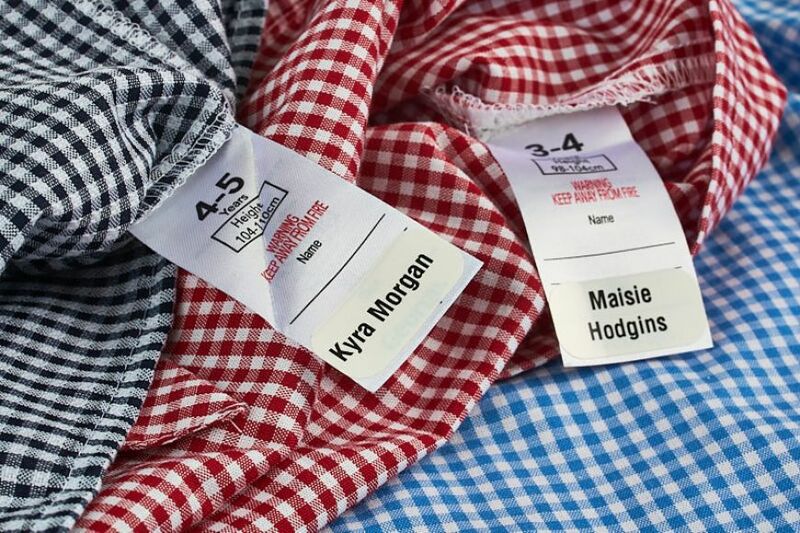 Apply labels in seconds with no sewing and no ironing required - Stikins simply stick on and stay on! Stikins have been independently tested for 60 washes at 40 degrees, meaning you can relay on our clothing labels always. With a white background and bold black font, all our labels are clear and easy to read. Our unique adhesive keeps your clothes securely labelled all year round. Our stick on clothing labels have received over 6000 positive customer reviews from families across the UK; with our multipurpose stick on name labels you can get your family's collective wardrobe safely and securely labelled in seconds! Find out more by reading these reviews and blog posts about using Stikins to label all your children's clothes. Excellent product. We use them on all sorts of items, from clothing to water bottles. They're quick and easy to use and stay on through the washer and tumble dryer. Love these labels! Stick onto anything from water bottles to clothes labels. Not fancy but the work brilliantly. Just bought my fourth batch! Love Stikins, really brilliant, especially as the clothes can be washed and the label remains intact,a much better way , easy and convenient to label my childs uniform. Love these labels as they stick on clothes, pack ups and water bottles and last. Just placed another order for Stikins Name Labels! My eldest is in year 6 and we've had these labels since reception. Great product! Never had one label fall off! Thoroughly recommend. Thanks Stikins for all the "lost clothing" that has been returned over the years!! Excellent, versatile labels that stay on like new to water bottles and clothes wash after wash. Good value for money.